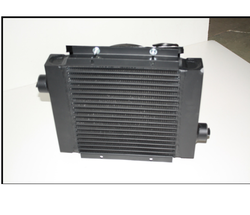 Our range of products include oil cooler. Teccon Oil Coolers are either fixed or of a packed floating head type in general and are suitable for fitment on the return line of a hydraulic oil system. The normal design pressure of these coolers are 10 bar and they are tested hydrostatically at 15 bar. However, on specific request, these coolers can be designed for a high-pressure circuit for as high as 50-75 bar. The hydraulic oil coolers designed by us have found extensive usage in power packs, presses, dredgers and plastic injection equipment. We design all these coolers as per IS, DIN or TEMA standards. Teccon has been in the designing of Oil coolers for the past three decades and we have a very good customer base throughout India. We have also exported to many other countries including South-East Asia, Middle East, USA.